No. 39, Jalan 5, Central Industrial Park, Batu 5, Jalan Kapar, 41400 Klang, Selangor, Malaysia. SPEEDY BEST SDN. BHD. was incorporated on the 6th day of February, 1995 as a subsidiary of TA’ CHEN INDUSTRIES SDN. BHD. 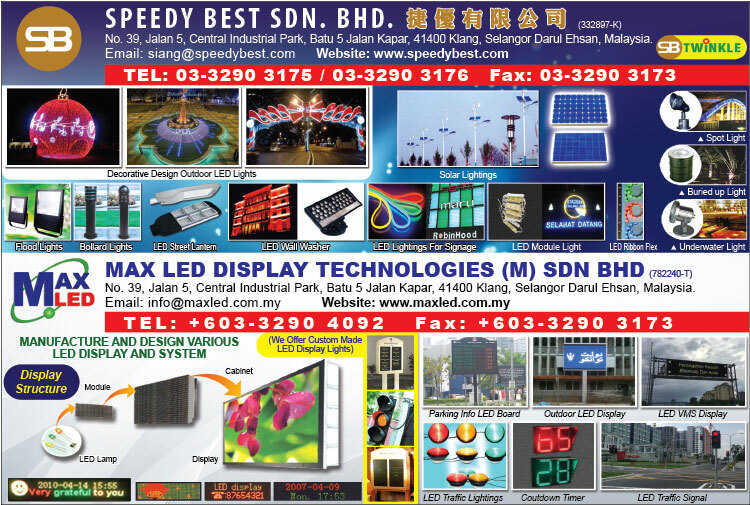 which was established in 1988 as a leading manufacturer of Decorative Lightings in Malaysia. TA’ CHEN INDUSTRIES SDN BHD. is an exported-orientated manufacturing company whereby 100% of our products are exported to overseas market like the United Kingdom, Ireland, Parts of Europe, Australia, New Zealand and Singapore. As an export oriented company, Ta’ Chen’s lighting products are required to undergo strict testing and quality control process to obtain 100% satisfaction. SPEEDY BEST SDN. BHD. was then established as a leading importer and supplier of LED lightings for local market. Till date, we have participated in various local projects both in Private and Government sectors. We are an experienced and reputated company. As a manufacturer, supplier and designer of lighting products for more 20 years we can provide advises and suggestions to our clients on Indoor and Outdoor Decorations. We work closely with consultants, architects, designers and electrical contractors to fulfill the requirements of all our clients and we always emphasis in Quality, Innovations, and Services to all our clients.